The Augsburg Podcast featuring voices of Augsburg University faculty and staff is one way you can get to know the people who educate our students to be informed citizens, thoughtful stewards, critical thinkers, and responsible leaders. Episodes of The Augsburg Podcast will be released periodically during the summer of 2018. Subscribe to the RSS feed or on iTunes. 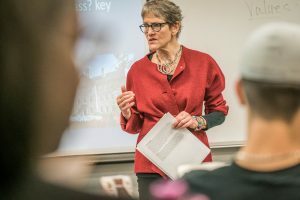 Marty Stortz, Bernhard M. Christensen professor of religion and vocation, guides her students as they ask powerful questions and find neighbors in our world’s many faith traditions.